When I saw the column by Duluth School Board members Ann Wasson and Bill Westholm on Nov. 23, I hoped they were offering an apology for raising property taxes almost 12 percent after assumptions on Red Plan funding went awry. Instead, in the column titled, “Running fewer schools results in savings that are applied to repaying bonds,” they offered a tremendous amount of spin on general-fund deficits and Red Plan bond repayment. The way I see it, the school district gambled on real estate speculation with taxpayer money and lost when it couldn’t sell buildings made excess by the Red Plan to make bond payments. As a result, bond payments have to be taken from the general fund, which now has to be replenished by higher property taxes. Obviously, the taxpayers can’t make the students suffer because of poor planning by the school district. However, I think the district does owe taxpayers an apology. I’m going to Chicago without my computer tomorrow. If I don’t wake up and resume my meditation in the middle of the night it will be several days before I’m likely to continue it. My Buddy emailed me this caution after reading the first of my tedious meditation posts about the prevarications I aledge that Dr. Dixon practiced. Point well taken Buddy. We’ve discussed whether George W Bush was a liar before. As I recall I never accused him of being a liar and certainly not a pathological or compulsive liar. He’s a politician who practices the art of persuasion. If his facts are fanciful as they were when he warned of a nuclear Iraq or talked of WMD’s I’ll cut him some slack for what his Sec. of Defense Rumsfeld would have described as “unknowns.” I think he misled America but that’s mostly because I think he misled himself and then, like other Presidents before him, wanted to convince himself of the rightness of his cause. I think the notion that a good cause can justify an untruth is pretty common. We often speak of the means justifying an end. Well, the beginning of the end of the Duluth Schools is already here and Dr. Dixon can be judged by that end. We have almost completed the Red Plan schools and we have some early data on the consequences. Classrooms are bursting. Our schools state test results are meager. There has been a flood of children exiting our schools. Our fund reserve is about to evaporate and voters have routinely been voting down operational levy requests. If these things were not true and the Duluth Schools were prospering it might be easier to overlook the things Dr. Dixon said and did to build the grandest, most expensive new school facilities in Minnesota public school history. In time Duluth might yet achieve a renascence in its public schools but that time lies in the future. For the time being Duluth’s schools are the main drag on community growth and well being. In fact, the public schools are floundering at a time of exceptional community success if this MPR story can be believed. I believe the Duluth Schools will eventually catch up and overcome the disastrous consequences of having the Red Plan forced down the throats of voters. As a truth groupie I believe, rightly or wrongly, that understanding what Dr. Dixon did to get his way is one of the ingredients that will help Duluth get past his follies. I’m not a journalist, I didn’t do the kind of deep research a good historian would do to dig up the details of what is a pretty minor story in the larger world. Hell, its almost over. I did, however, pick up hints and clues which explain Dr. Dixon’s hold on Duluth and while I don’t think them flattering I find them interesting. In my view Dixon is a scoundrel and Duluth is paying a price for falling under his influence. I’ve got a dozen other things I’d like to post about right now. The movie “Lincoln”; a short upcoming trip to Chicago and the great book I’m reading to Claudia about the World’s Columbia Exposition held at the City in 1893. Its a story about Chicago and the most remarkable and unsavory serial murderer in our nation’s history. He was a sociopath something I was told by a resident of Faribault that they though Dixon was. Dixon was no H. H. Holmes but he’s a piece of work and for better or worse he will have exerted a larger impact on our city than any other person I can think of since I first took up residence here in 1974. That’s an impressive list to stand on the top of including: Jeno Paulucci, Andy Borg, any of our Mayors or Congressmen. Dr. Dixon single handedly changed our our public schools overnight like that meteor that killed the dinosaurs 60 million years ago. It’s now up to Duluth’s voters to crawl out of their holes in the ground and undo the damage. I don’t think a school board in denial about the consequences of the Red Plan is one we can count on to help us begin the recovery. My next post will be about the Dr. Dixon I’ve learned about. It will be sketchy. It will be a reach. I do a lot of speculating. It won’t be gospel. With its completion I hope I too can begin to recover from Dr. Dixon. The rest of the column is more space filler. It doesn’t continue flogging Art. It does not admit any culpability in the sorry state of the Duluth Schools. It simply asks for community help. its entirely appropriate and hopeful. I believe it is undermined by the beginning of the column which attempts to vilify Art Johnston for being right while saying he’s wrong. I think its time someone in the Duluth Schools owned up to the damaging consequences of the Red Plan. That would be refreshing. Someone screwed up. Other’s followed but not to foul of the schools but because they were believers. They were misled. In some cases lied to. They should, perhaps, have been less credulous but they were not themselves liars. They were boosters. They were parents. Their path to hell was paved with good intentions. This brings me full circle back to the first post in the series. Their leader Dr. Dixon was a scoundrel and worse. I don’t blame the W’s for the current state of the District more than I blame myself. We are all to blame. Had we acted differently our schools might not be in this fix. A little more candor about our situation and how it came to pass might be very much appreciated at future community brainstorming sessions which Ann and Bill’s column calls for to solve the problems in our schools. In addition to actively and cooperatively controlling costs, a change in the district’s revenue stream through increased state funding or a successful operating levy would help immensely. provide advice regarding budgets, student achievement and school climate. City, business and higher-education leaders are providing invaluable advice and support as schools step up to meet challenges. Organizations often work with the community to develop a common vision that can help identify priorities and make the best and most efficient use of resources. This winter, members of the community are being invited to participate in a community-wide conversation regarding education in Duluth. People will be asked to talk about what’s going well with Duluth schools, what could be improved and what specific needs should be addressed. A detailed list of meetings and other ways to participate in this important discussion will be released by mid- to late December. Schools are part of our community; some would say they are the heart of a community. We appreciate everything members of the community do to support education and look forward to further conversations this year as we continue to take on the challenges of public education in Duluth. Before I analyze any more of the column its worth recalling the title given it by some DNT editor “…Running fewer schools results in savings that are applied to repaying bonds.” Its worth remembering because the Trib is putting those words in Art Johnston’s mouth. Art would never make that claim. He would simply say the way the Red Plan was implemented and financed crimped, crippled maybe, the operational budget. General-fund deficits have been a fact of life for Minnesota school districts for at least 20 years, well before the school construction projects began. In Duluth, as in most school districts, general-fund deficits occur simply because operating costs are rising faster than revenues. School districts have little control over revenues, so strategies to reduce deficits generally center on controlling costs and making budget cuts. Yes, and No. Before I was elected to the School Board in 1995 we had just been in statutory operating debt. Two years before I got elected the District paid off the debt and built up a “ten percent reserve” over and above annual costs and kept that reserve for the remaining eight years of my tenure. Today, thanks to the Red Plan it is being spent down. The DNT’s education reporter told me it was down to four million dollars and that she expects it all to be spent within a year. That reserve is paying off bonds among other things and when it is gone you can expect increasing teacher layoffs or a new bout of Statutory Operating Debt. The next two paragraphs are generic space filler. Westholm and Wasson are right about one thing. The bonds will have to be paid off. (That’s what I wrote in the last post) The only way to put more money into classroom size reduction is finding more money. That means more local property taxes. They need the voter’s approval for that. Oh there is the possibility of the State raising school revenue but there is no way the State will compensate for the excessive bond repayments for Duluth’s Red Plan. During public School Board meetings, we’ve had bond counsel and other financial experts talk with us about Johnston’s concerns and ideas. While the savings could be used to offset the deficit (which is different from causing the deficit) the bonds still would need to be repaid. That means either properties would have to sell for more than projected, or property taxes would need to increase to replace the savings. Johnston suggested calling the 20-year bonds early and attempting to refinance. Even if that were possible, doing so would not prevent a deficit. Instead, it would further increase borrowing costs related to the project. will end up paying the banks more for the mortgage because they’re payments will be strung out much further, say for five or ten more years. Its the trade off for more money now. That’s Art’s point. If our classrooms are gross and unwieldy now we can reduce their size by extending our loans while the borrowing costs are so low. We will still be paying for the Red Plan thirty years from now but renegotiation the loan will mitigate much of the current damage being inflicted on students and teachers today. That has a cost too. Prospective students and families will look at our overcrowding and seek out other alternative schools for their children. Every child lost to our schools inflicts more damage and accelerates the downward spiral. I think there is one reason and one reason alone for the W’s to be blind to this. Renegotiating the bonds might be considered an admission that the Red Plan was a mistake and that they did not anticipate this. Ann Wasson, currently the Board Chair as she was when the Red Plan was sent to the state for approval has her finger prints all over the Red Plan. Bill Westholm, once a candidate for Superintendent himself and Dr. Dixon’s top aide during the Red Plan Plans did little to throw water on the fire. In fact, Mr. Westholm may feel a touch responsible for Ann’s unwavering faith in the Red Plan. He was one of the silent administrator’s who refused to get in Dr. Dixon’s way. Bill has never been one to stick his neck out. I saw that as a school board member. He served on, perhaps chaired, a principal committee that sought relief from our Districts’ excess facilities capacity when I was on the board. The Committee delivered a stay-the-course report which is what was in force when Dr. Dixon came aboard and broke the Gordian Knot closing one unnecessary high school. Oh and spending hundreds of millions to close the school. No savings in that no matter how much the W’s protest the contrary! His assertion would be accurate if there were no savings and money was being taken arbitrarily from the general fund to make bond payments. However, that’s not the case. Running fewer schools has resulted in about $5.3 million in annual non-teacher savings that are then applied to the bonds. The first paragraph is intentionally wrong. It claims that Art has said running fewer schools has cost more money. Clearly Art has said that the Red Plan (as it has been implemented) is costing more money. The simple fact is that the bond holders who lent money to ISD 709 are first in line to be repaid. We have to pay them twenty million a year back for twenty years first. We run our schools with whatever is left of the general fund after our debts are paid off. Twenty million was my calculation for annual repayments back when the Red plan was going to cost 257 million. It’s since grown by 56 million so we are having to pay back more than twenty million a year. As the W’s noted we raised taxes, are selling buildings and used staff cuts (savings) to pay for the Red Plan. Recently our School Board all but decided to levy to the maximum to salve our swollen classrooms. I would have voted to do the same thing although not happily. The building sales were grossly over inflated. There was no way the District would raise over twenty million for old schools. Finally, I do not believe the District when it tells us that laying off staff has nothing to do with the bond holders who have first dibs on operational monies. If we were not paying off the bond holders for the Red Plan borrowing there would be no need to cut teachers. It is obvious that the original assumptions of savings were grossly in error and that subsequent changes to the Red Plan have shot them all to hell. And about those changes. They are notoriously expensive. Any changes to original construction contracts once building has begun are called “change orders” and whatever spending constraints were built into the first contract are lost as changes are made to the plans. I’d love to know how many change orders have been implemented as the Red Plan ballooned from 257 million to 315 million dollars. I understand the attack on Art Johnston by his eight detractors on the School Board. They are not however mad at him because he is wrong. They are mad at him because he is annoying. His complaints sabotage their efforts to put voters in a good frame of mind to pass future excess levy referendums. They highlight the bait and switch elements of the Red Plan and its impossible, too good to be true, selling points. I have no love for Art myself. I was so mad at him when he won election that I wrote to him in an email that I was glad he won because, since he was in the minority, he would get the same sort of carping and criticism that he aimed at me in the small Let Duluth Vote circle we both inhabited. Art and I were allies at one time but his partner happened to work at East High and as near as I can tell reported every angry thing ever said about me by the teaching staff there to protect him from having his association with me drag him down to my level. That is, my assumption. Art’s a rough cob. He’s not wrong. At least not about our having to pay the bankers back with operational money. “None of this is new information.” That is the concluding sentence in the columns opening paragraph. It is intended to be dismissive of charges that the Red Plan has hurt programming and caused overcrowding. It is, however, an incomplete list of the means the District has used to finance the Red Plan. In addition to tax increase’s, property sales, and general-fund savings it has been funded by cutting staff and programming. This became necessary when some of the expected “savings” failed to materialize and costs for the Red Plan grew by 56 million dollars. Duluth is nearing the end of a facilities project that reduced the number of Independent School District 709 regular school buildings in operation from 18 to 13. Those 13 schools were modernized through nine building updates and four newly built schools. Bonds sold for the project are paid for through a combination of a tax increase that began in 2008, property sales and general-fund savings resulting from reducing the number of schools in operation. None of this is new information. Here are the anticipated savings which were given the Dept. of Education back when the Red Plan was only going to cost 257 million. Art Johnston who is the target of this column estimated years ago that the changes to the Red Plan left the new school facilities roughly the same size as the old facilities even if they were spread out in fewer buildings. I suspect this is true. Certainly two energy hogs were added when the two new swimming pools were added. In addition each new and improved school was equipped/saddled with expensive JCI environmental controls. If there have been no energy savings it means that the District must pay the Red Plan bond holders back with other funds to the tune of an additional million dollars each year. To my knowledge there have been no energy audits since JCI’s Red Plan schools have been built. 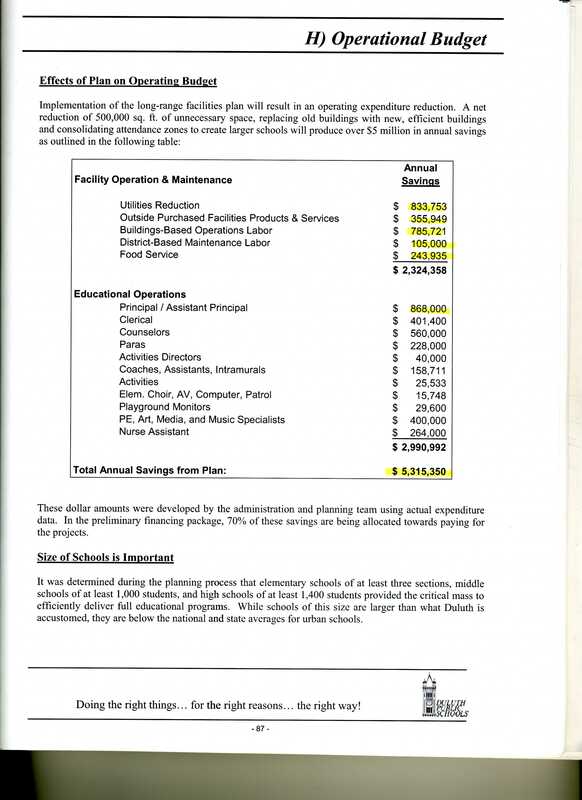 Surely, by now there must be some evidence of the $833,000 in energy reductions which the District claimed. If so I would expect the District to trumpet the savigns and bask in self congratulation. Of course, if JCI’s sorry if not fraudulent overselling of the Duluth Steam Plant energy savings is any indication the Duluth Schools have gotten very little energy savings by closing four schools. As for the staff reductions outlined for the MDE (Minnesota Dept. of Education) they do not call for cramming more children in classrooms which is what has happened in the ISD 709 schools. Four fewer schools are expected to need fewer janitors, secretaries and principals etc. Furthermore, it was explained that with larger and fewer schools there would be less need for inefficient traveling by staff between schools which eats up productive time with travel. It appears to me that very little of what was predicted in the original Red Plan has come to pass in terms of savings. If I am right it means that contrary to what Bill Westholm and Ann Wasson have written there is a lot of new information about the Red Plan. The only problem seems to be getting it. Duluth is nearing the end of a facilities project that reduced the number of Independent School District 709 regular school buildings in operation from 18 to 13.
revenues. School districts have little control over revenues, so strategies to reduce deficits generally center on controlling costs and making budget cuts. 20 years. Reductions have been realized at various times to district and school administration, health insurance premiums and as many non-classroom areas as practical. Unfortunately, we’re well past a time when cuts can be made without impacting the classroom, as evidenced by an increase in class sizes this year. Ann Wasson represents District 1 and is the chairwoman of the Duluth School Board. Bill Westholm represents District 3 on the Duluth School Board. Two recent DNT stories help lead into the discussion of lies and expectations. The first had to do with the building of a walking path to the new western Middle School. One might have expected that a 315 million school building plan that relocated a school and did so arguing that it would encourage more pedestrian traffic to the school would have set such a path out long before the opening of the school. Instead money ran out for this and the parents had to do it themselves. The other story was just a mention in the Eh column saying that the Duluth schools would really like contributions for its poorly funded art program. The first story suggests that there were a few Red Plan facilities oversights. Considering that the original Red Plan had a sticker price of $257 million and ended up costing (so far) 315 million (not counting interest) its hard to imagine how money for such an obvious need could have fallen short. Certainly the additional 56 million over the initial price tag should have covered it. But then again that money went for extras that were not part of the original package like a stadium for the eastern high school and two eight million dollar, eight-lane, state-of-the-art competitive swimming pools. Perhaps such spending on googahs clouded someone’s eyes. I take the swimming pools a little more personally than many. I have some small experience with competitive swimming and I was a worse than mediocre swimming coach. In fact, it was my ability to coach that brought me to Duluth almost 40 years ago. the swimming pools were added to the Red Plan shortly after I was defeated by swimming affacinado and Red Plan supporter Judy Seliga-Punyko. I’ve always wondered if this wasn’t a bit of a reward to Judy from Keith Dixon whose Red Plan I had panned for being put into place without a referendum vote. If so it was just one of many tens of millions of dollars worth of changes – changes which were only possible because spending was not locked into place by the wording of a referendum which would have specified where the spending was to be made. I take the art stuff pretty seriously too. I am one of Duluth’s best known public artists even if my work is ephemeral. Further my Mother was an artist and took up the cause full time after my Father’s death. The failure to be able to provide supplies for this subject matter because of misplaced funding priorities really is an indictment of the current School Board. What is the priority? Buildings of course. After these two stories an op ed piece was offered up by two of the current School Board members attempting to dismiss the charge that the Red Plan had anything to do with over crowded classrooms and other cuts to school programs. If I didn’t already feel a need to elaborate on my conviction that Dr. dixon was a pathological liar this column had my head spinning in many different directions. I’ve been stewing about it ever since and so it too will become a subject of this extended meditation. Since its not a “story” written by the DNT staff I don’t think copyright applies to it. Therefore, the next post will be the column in its entirety. I recently told the reporter on the education beat for the Duluth News Tribune that I thought Duluth’s former school superintendent was a “pathological liar.” It may turn up in a story she is contemplating on “the” broken promise of the Red Plan which I take is the supposedly iron clad guarantee by Dixon that the Red Plan would not entail any further tax increases that it had all been paid for by funds raised by the school district in its initial financing. I was quite serious in using the term which unfortunately may be construed by many as hyperbole. I did not intend it as so and yet I did not provide the reporter with all the hints I have had that this may be a correct assessment. This has put a burr under my saddle to further explain or document the evidence for my assessment. Certainly long time readers of my blog, the eight of you, are well aware of this preoccupation of mine. One has only to type Dixon and liar into the blog’s search function to find copious entries that tie the two words together. There is some irony for me on this subject for I have spent the last half year undoing the damage for having put my trust in another pathological liar a fellow named Jeff Marvin. Again there are several posts on Mr. Marvin and his business dealings. At one time I was going to write a long series of posts explaining how I ended up writing checks to the man for a hundred thousand dollars to fix a wet basement only to discover he ordered damage to the the sewage pipes to be covered up leading to a godawful mess. Frankly I was far too overwhelmed fixing the damage to write it all up. I only completed, largely, the repair work the day before Thanksgiving. Exposing Dixon’s many duplicities has become for me, as I said, a preoccupation but it is wrapped up in a larger concern of mine – the future of the Duluth Schools post Red Plan. Long after the good superintendent’s departure the folks in charge of the Duluth Schools are caught up in the sorry task of explaining away the unanticipated consequences of the way Dr. Dixon did business. As a truth groupie I believe that full disclosure and confession would be the best way to turn our schools around. Yet, this path is not being taken for a lot of reasons but most importantly because most people find confession unpalatable. I can’t confess for other people. I don’t really know what other people are thinking. That doesn’t mean that I don’t have theories. This series will be my best speculation about the things that are currently being said to explain away the past decisions of the Red Plan. It will take a fair bit of writing and I’m not much in the mood to write about it because it feels like a chore. But I’ve gotten very good at doing my chores in recent years – like fixing the basement I unwittingly allowed to be undermined by a month’s worth of sewage. The following posts will be a little like my recent war against tens of thousands of dung flies. JCI has used this phrase to cloak all its work with public entities despite long standing requirements by the State of Minnesota to act in a transparent way with public money. This stonewalling helped prevent citizens in Duluth from finding out how Johnson Controls managed to bamboozle the Duluth School Board into accepting a breathtakingly vast scheme to rebuild all its schools so that operating moneys would no longer be squandered on facility maintenance. The result? Five million bucks of operating money now go annually to pay off the JCI built school bonds and our high school classrooms typically have an obscene 40 kids in them. This is just the opposite of what JCI promised the community. The plucky little Timberjay Newspaper of Orr, Minnesota, has been doggedly trying to ferret out the public data from JCI for a similar bamboozelment based on preposterous claims for energy and tax savings to rebuild the St. Louis County Schools. The paper recently won a unanimous Appeals Court decision giving them access to JCI’s tightly controlled data. Not surprisingly JCI has appealed the decision to the State Supreme Court. I think the Timberjay should ask the Supreme Court to order JCI not to tamper with any of this data to make sure that it does not conveniently disappear before JCI loses again. TEXT: REGIONAL, Attorneys for Johnson Controls, Inc. and Architectural Resources have petitioned the state’s Supreme Court to hear an appeal of last month’s decision by the Court of Appeals in a public information case brought by the Timberjay. The decision to seek review was no surprise. JCI attorney David Lillehaug had vowed from the beginning to fight the Timberjay’s information request to the state’s highest court. Unlike the Court of Appeals, however, the Supreme Court has discretion over which cases to hear, and in civil matters the court only grants about ten percent of review petitions that come before it. But Timberjay attorney Mark Anfinson said the high profile nature of the case, which has already received extensive statewide publicity” makes it more likely that the court would agree to hear it. “The complicating factor for us is that this case is probably seen as more important than most,” he said. JCI’s petition comes in the wake of an appellate ruling last month that found that the company was performing a governmental function when it contracted with the St. Louis County School District for the construction and renovation of several schools. Under state law, that means that documents in the company’s possession, related to that project, are subject to public request, as if JCI were a public entity. The Timberjay, back in March 2011, had requested to inspect the architectural subcontract between JCI and Architectural Resources, the company that JCI hired to provide design work and drawings for the school projects. JCI denied the request, beginning a legal process that has now taken more than 18 months. The latest move by JCI means further delay. The Timberjay now has 20 days to file a response to the petition, and the court typically indicates whether or not it will hear the case within 30-40 days. If the court does take the case, it could be a year or more before a decision might be issued. Meanwhile, the Timberjay recently filed a second information request with JCI, seeking energy savings calculations for the school projects. The company had claimed in documents submitted to the Minnesota Department of Education that the work it was proposing would save the school district $380,000 a year in utility costs. But a review of utility bills by the Timberjay found that utility costs at the new schools are substantially higher than in the past. …into retracting their call that Ohio was going to Obama. A lot of angry billionaires. “The billionaire donors I hear are livid … There is some holy hell to pay. Karl Rove has a lot of explaining to do … I don’t know how you tell your donors that we spent $390 million and got nothing,” – A “Republican operative,” to HuffPo. Apparently America is in danger of surrendering to the tyranny of fairness. Cameron Hughes Lot 25 – Officially a Napa sparkling wine.